Originally developed in 1942, the CRANE Technical Paper No. 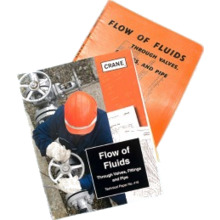 410 (TP-410) is the quintessential guide to understanding the flow of fluid through valves, pipes, and fittings. 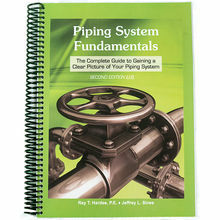 The manual is intended for Design Engineers, Plant Engineers, Facility Managers, Maintenance Technicians, Mechanics, Building Owners, Plant Operators, Safety Engineers, Recent College Graduates, and Sales Representatives to aid in selecting the correct equipment and parameters when designing and operating any piping system. The 2018 edition, features a brand new chapter on sensible heat transfer in piping systems, in-depth information on compressible fluid flow and an iterative method for sizing flow meters. Also included is an in-depth discussion on cavitation and choking in control valves - as well as a method for viscosity correcting a centrifugal pump curve and clarification of the calculations for non-circular ducts. New images, equations, and graphs can be found throughout, increasing the value of the TP-410 as an educational tool and industrial reference for personnel involved in the fluid handling industries for generations to come.